~~FREE SHIPPING~~ on every item in the Store! SEE BELOW for full details about this book. SEE BELOW for full details about this book and CD. SEE BELOW for full details about this CD. 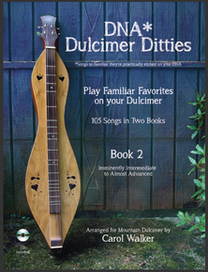 35 more familiar favorites -- In Book 3, the final installment of the DNA* Trilogy, you'll find longer and more complex chord-melody arrangements, unfamiliar chord shapes, more "delicious" chords, lively rhythms, lovely legato settings that will melt your heart, right-handed fretting, two-handed tapping, and string bending. Following the style laid down in the the first two books, you'll continue to learn new concepts and techniques which are introduced and layered in sequentially, and presented in such a seamless manner that you'll be completely unaware of anything more than building a huge repertoire and becoming a more confident player. As always, you'll find the included CD a wonderful tool to help you master these challenging ditties. Special Feature: I've added some short "demo" videos here on my website to help you with the more technical stuff. Click here to view these now. As you work your way through all 140 songs in this series, you will truly be on your way to mastering your dulcimer, and you'll be adding a huge chunk of Americana to your repertoire. PLUS, you'll have a great time in the process! I promise!! "Your keyboard chops and overall musicianship come through loud and clear everywhere, which I appreciate so much because it is extremely rare in the mountain dulcimer world. The lightness and sense of humor is ever-present. I really believe in repertoire and having fun with music, and you've got an amazing selection of well-known songs in these books. 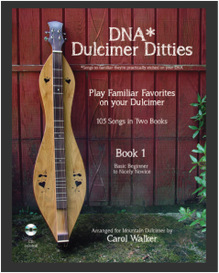 As you say, this is the stuff I WISH I had when I first discovered the dulcimer." "I’ve recommended the first two volumes to a number of people. Your step-by-step approach makes so much sense, as far as I’m concerned, you’ve written the default textbook. If #3 is as good as the others, it will be a real treat for people." You've been playing the mountain dulcimer but you need a fresh, new approach that will bring your playing to a new level. Carol Walker has the perfect solution with her fingerstyle technique, “delicious” chord voicings, and beautiful song arrangements. After covering the “nitty gritty stuff” - tuning (DAD), holding the instrument, fretting exercises - Carol starts you off with the old fiddle standard, Bile Them Cabbage Down. It’s almost unrecognizable, though, as she slows it way down and employs right hand fingerpicking and smooth fretting technique to give it a sweet, lyrical sound. 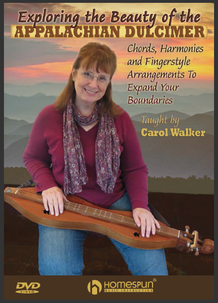 Learn how to add “power chords,” vibrato, slides, picking patterns, chord substitutions, the use of the capo, practice exercises, and other invaluable techniques to your dulcimer repertoire. You’ll learn gorgeous arrangements of Long, Long Ago; Wayfaring Stranger; The Milking Song and The Goodnight Song (from Isle of Man); and the beautiful American hymn, Simple Gifts. Novices and accomplished dulcimer players alike will delight in Carol Walker’s unique approach to the traditional 3-string mountain dulcimer. Dulcimer tablature and standard notation for every song are included. The first -- ever! -- dulcimer book devoted exclusively to Manx music. 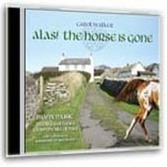 Instructional book with 34 traditional Manx songs, arranged for all levels -- beginner to advanced. ~~16 songs are on a companion CD (see below); remaining tunes are available as free downloads to aid in learning. This instructional book picks up where the first book left off, with over 50 more tunes, arranged for players of every level. If you enjoyed the "Milking Song," "Gyn Ennym," "The Goodnight Song," or the "Water Kelpie" in the first book, you'll absolutely love these new arrangements. This is my biggest and bestest book yet -- it's a hefty 118 pages! But WAIT! There's MORE -- waaaay more! 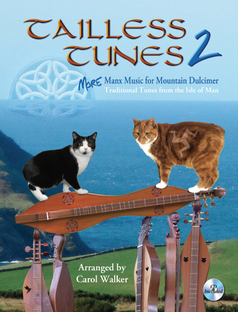 ~~CD INCLUDED of EVERY song in the book, played by Yours Truly on my favorite dulcimers. This CD will be a valuable tool to help you learn the songs, PLUS it will be an enjoyable CD just for listening. ~~Several modern Manx composers have given me permission to arrange their tunes for use in this book. I think you'll agree that these current working musicians have done a splendid job in maintaining the character of the ancient, traditional tunes. These fresh new tunes are at the top of my list of favorites!! 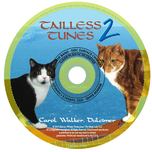 This CD contains 16 of the songs from Carol's first Manx book, Tailless Tunes, arranged and performed by Carol on her dulcimer, harp, piano, upright bass, melodica, and even some vocals! 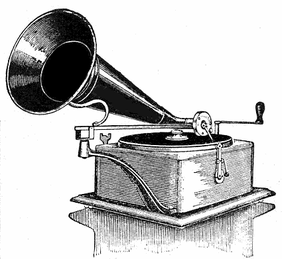 She is backed up on several tracks by Toby Walker on guitar and percussion, and Brian Lindsay on fiddle and whistle. 51 familiar favorites -- rounds, cowboy songs, railroad songs, patriotic songs, Stephen Foster songs, hymns, spirituals, carols, nursery rhymes, and timeless traditional favorites -- all arranged sequentially to help you easily learn new techniques on your dulcimer. 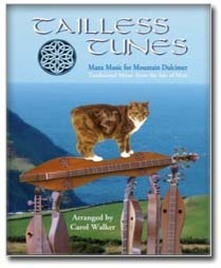 Includes a CD of every song (played by Carol on her dulcimer), along with some spoken "mini-lesson" tracks. The book is loaded with instructional photos, anecdotal tidbits, charming illustrations, and a few surprises! 54 more familiar favorites -- Book 2 picks up where Book 1 left off with new chords and chord shapes, unexpected harmonic surprises, fingerpicking techniques, use of the capo, harmonics, hammer-ons, pull-offs, and other techniques leading to masterful, musical performance. Just like Book 1, this book is also full of fun stuff, and includes a CD of every song. 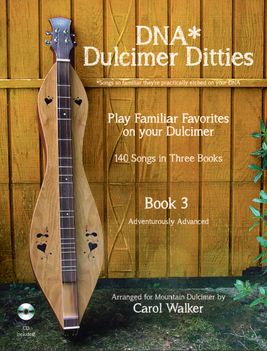 As you work your way through all 105 songs in this series, you will truly be on your way to mastering your dulcimer, and you'll be adding a huge chunk of Americana to your repertoire. PLUS, you'll have a great time in the process! I promise!! © 2014 - Carol Walker | The Music Lady, LLC. | All Rights Reserved.